In what is being called both tasteless and sacrilegious by some local residents, St. Guiseppe-de-Pina has recently been sold to a private interest and declassified as a protected historical landmark. 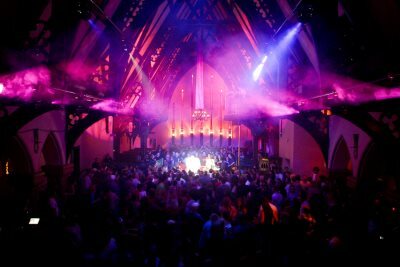 To make things worse, Luca Brizito who purchased the church at a city-run property auction, has decided to ink a deal with a popular local rave promoter to use the soon to be restored facilities as a new semi-permanent venue for the well established underground rave scene. Using funds generated through years of party promotions, THE DREAM SYNDICATE, a co-op run promotions company has signed a multi-year contract with Brizito for the rights to use the venue four nights a week as an after-hours dancehall. With intentions to feature the highest quality sound system and lights second only to STEREO, THE DREAM SYNDICATE aims to use the facilities to create a physical hub in the city for ravers to network through. The rest of the time, the building would operate as an office to carry out the necessary work to ensure that everything is to code when the venue launches. Though everything has been arranged in full accordance to the law, local citizens and ex-members of the old church are outraged. "I don't see how they could just rip apart a piece of history like that and turn it into some sort of sicko soc-hop," says Douglas Miller, a local senior resident. The sale was allowed to go through by the city for a variety of technicalities but locals are not going to ease on their protests until further proof is demonstrated by the city that the deal and decision to declassify the church was legitimate. A private inquiry was launched and is being spearheaded by Douglas Miller, a local resident, in hopes that the decision can be overturned before the new owners have a chance to move in. "There is no way these sick drug addicts are going to end up in my neighborhood," Douglas Miller goes on to say. "We all know what they are going to do there. They are going to take drugs and listen to their satanic music and then spill out into our streets in the morning when we are out walking our dogs or gardening our lawns. We can't have that kind of danger around here and I hope the city will see how this will ultimately be a detriment to the entire community." Both The dream syndicate and Luca Brizito were given opportunity to publicly respond but have declined. As for the city, Crown-property expert Simon Hunt has stated that the sale is final and that Luca Brizito will be given the opportunity to launch the venue as long as he respects the strict set of codes issued by the city to run the operation.